Two weeks ago Brad and I found ourselves without kids as J and A attended the school’s youth group’s winter retreat. With the sun shining and some free hours ahead of us, we decided to drive towards the Hamptons and see how far we felt like going. In the end, we decided to go all the way to the end of the Island, (specifically Montauk) and I am glad we did. When I first learned that our family would be moving to Long Island, I immediately wanted to know where the Hamptons were in relation to Stony Brook in case there might be an opportunity for an Ina Garten sighting. I’m a big fan of the Food Network show, The Barefoot Contessa, and I own all of Ina’s cookbooks. In case you don’t know Long Island geography, there are actually quite a few Hamptons, such as South Hampton, Bridgehampton, West Hampton, and East Hampton. Each town is filled with shops, delis, galleries, and restaurants. Unfortunately, I didn’t have an Ina sighting on this trip. What made the day so enjoyable was the fact that it was more about the journey than the destination. Brad was very obliging and stopped when I saw something that sparked my interest. We mainly stopped to look at the water and enjoy the beach views, but there were a couple of shops that I wanted to poke around in as well. 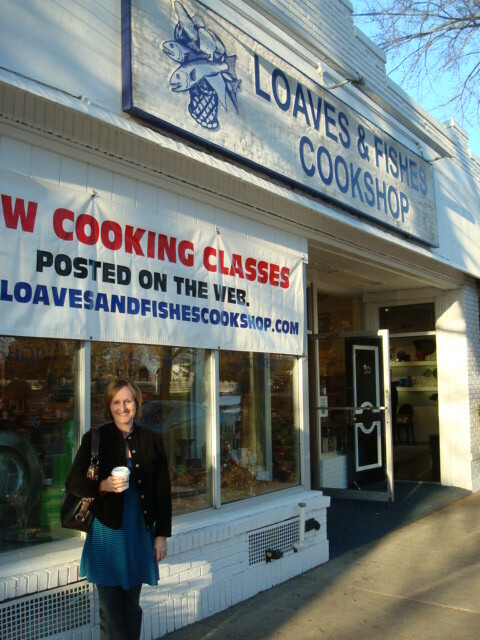 I was very excited when we drove through Bridgehampton and I saw the sign for “Loaves and Fishes,” which is a cookshop owned by Anna Pump, a mentor and friend of Ina’s. I admit I did the cheesy tourist-thing and had Brad take my picture in front of the store. For a January winter day, the weather was amazing. The temperature was in the mid-50s and it seemed as if everyone was out enjoying the beautiful day. The homes on this stretch of the island are works of art. Many have the traditional shaker siding with the weather-beaten look, and beautiful gardens surround the homes. Although many of the houses are hidden behind hedges, I found I could still peek through and ooh and ahh at the views. As we neared Montauk, the sun was beginning to set and the moon was rising. It was a full moon too, which made it even more spectacular to watch. We weren’t the only spectators watching the sky color orange and pink, and the moonlight reflect white on the water. I have come to consider days like this one as a gift. Most of my days aren’t like the one I described above. I have duties and responsibilities that demand my time and attention. I have two children that are normally home on the weekends. Thank you, God for a day that departed from the ordinary. Thank you for a day that spoke of your beauty through creation. Thank you for unexpected gifts. With your beautiful descriptions I can’t wait to see this area sometime when we are out there.